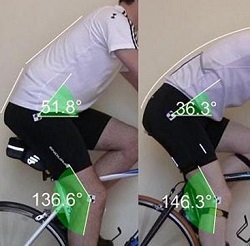 I was always wondering what it the correct position for all my joints during biking. What can be the most energy efficient and at the same time anatomically less stressful position I should have. Here is a wonderful website that gives nice detailed guidelines and rules of thumb for proper body position during biking. This image shows two cyclists, with the one on the right in a far lower, more aggressive position. One might imagine that of the two, he might suffer more back pain. But this was not the case, with the cyclist on the left suffering debilitating pain, very quickly into a ride. The clue is in the angle of the pelvis. The rider on the left has a noticeable hinge point in his lower back as his pelvis is reluctant to lean forwards and the lower lumbar vertebrae appear to be immobile. The rider on the right meanwhile has a smooth transition from pelvis to lumbar region and along the whole spine. In the left hand case, the saddle was too low and the rider had a very stiff right hip joint. The excessive upwards movement of the knee and lack of mobility in the hip combined to push the pelvis back. There have chances to get lower back pain if you are driving long time.It is practically proven and I also like to bicycling every morning.Keeping one position means you must have lower back pain and shoulder pain. Thanks for sharing the information's.There are very good good physiotherapist in ryde is providing affordable treatment for this pain.